Kate King, Jo Savournin, Helen Appleton. This was the largest cast to date assembled by operahouse and the performance, that give us everything we wanted, was extremely well received by the capacity sell out audience at the Carillon Rooms. Cutting the opera’s customary dialogue the story was moved along by Paul Blakemore acting as narrator - giving a much better summary of the action than I am about to. This allowed the singers to make best use of the space at the Carillon Rooms. In her Act I aria the Queen of the Night persuades earnest Prince Tamino to rescue Pamina, her daughter, who is being held by the all-powerful Sarastro, High Priest of the Sun. The Queen of the Night is a crucial but short part – just two show-stopping, fiendishly difficult arias. As required, soprano Clare Proctor stopped the show twice on Saturday night in the operahouse production. When a soprano can toss off the arias’ fearsome passagework, capped by frequent leaps to high F, with the kind of command displayed on Saturday, it makes the Queen seem chillingly demonic. Clare Proctor also appeared as the Princess Pamina - her own daughter – sympathetic in a very different role, requiring lighter and more poignantly lyrical singing. Lyndon Gardner played Prince Tamino, with characteristic grace and was in good voice for this lyric role as the heroic Egyptian Prince, who runs out of arrows when fleeing wild animals. Saved by Three Ladies, servants of the aforementioned Queen, he is introduced to Papageno – a bird catcher. The Ladies were sung by Rachel-Louise Stonehouse, Kate King and Jo Savournin – three voices that blended together exceptionally well throughout the evening to the extent that they could have been one character. Alan Speight played Papageno with confident singing, a warm tone and excellent dramatic ability. Andrew Lamb made a welcome return to Loughborough as the wicked Moor Monostatos, a servant of Sarastro, a role he both sang and acted well. David Henshaw played Sarastro, the antithesis of the Queen, both vocally and dramatically. The role requires very low and legato singing and David’s poise and dignity was just right for the role. Helen Appleton completed the cast as Papagena giving a light and cheerful performance as the old woman who is transformed into a young woman and becomes the wife of Papageno. Operahouse were accompanied at the keyboard by Anthony Wilson with Sara Kemsley playing the flute, piccolo and keyboard, adding extra dimensions to the piano accompaniment but not detracting from the superb playing of Anthony. Finally, mention should be made of the children marshalled by Sarah Hammond: Kye Hammond, Iona King and Claudia Peach who played the necessary non-singing roles. 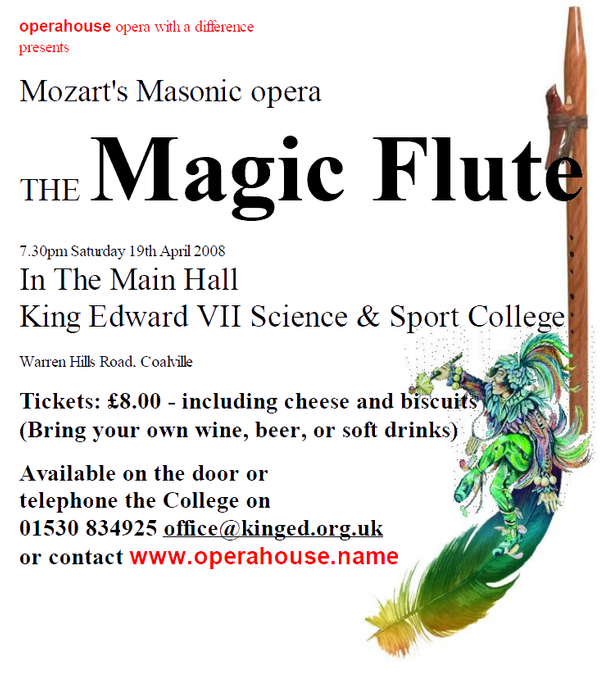 With all profits from the evening going to the Howe and Charnwood Masonic Charities, Wishes 4 Kids and Glebe House it was an evening where it was not just the Flute that was Magic. Operahouse describe themselves as a “small scale company with a big outlook”. 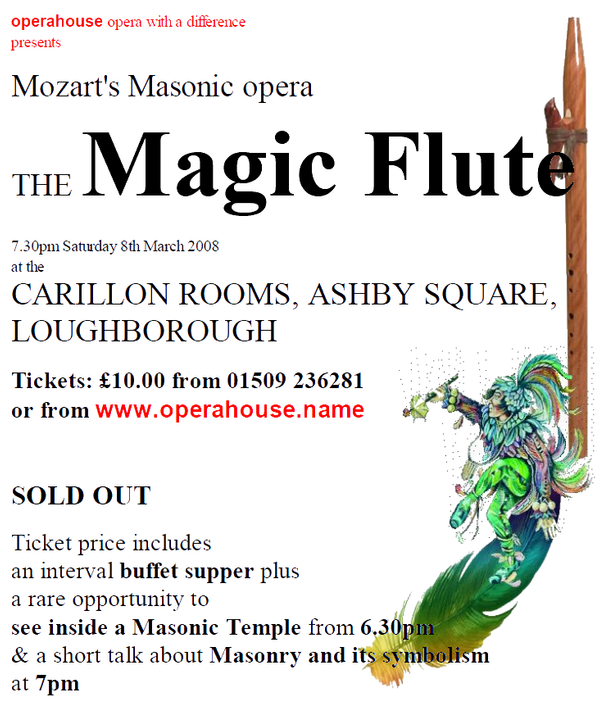 Their performance venues range from theatres to Village Halls and it was fitting they chose Loughborough’s Carillon rooms for their 2008 production of The Magic Flute given the composer Mozart’s connection with Freemasonry. Set in Egypt, The Magic Flute is a tale about the trials of life, of growing up, finding love and learning to be wise. It is an adventure and a fairy story, a comedy and drama set to music. The main story sees the journey of the hero, Tamino, in his search to find the perfect love, Pamina. She has her own problems in the form of her Mother, The Queen of the Night. Comedy is injected by the Bird-catcher, Papageno, who too, is desperate to secure himself a wife. Three ladies (also the Initiates) set them both three trials, here we see Mozart’s explanation of the initiation trials that are undertaken in the Masonic Brotherhood, to earn their just reward – the love of a good woman. Tamino with the help of the eponymous Magic Flute and Papageno, enjoying the service of elemental bells, survive the trials which lead them to secure the future happiness. Detailed narration, by Worshipful Master Paul Blakemore, led the audience through the plot and headed by Lyndon Gardner as Tamino, the whole company’s singing was of a very high standard. Jo Savournin made an impressive debut with operahouse as Third Lady/Initiate and Alan Speight who as the Bird-catcher combined his singing and acting skills to great effect. In choosing to undertake the two roles as Queen of the Night and her daughter Paminia, Clare Proctor was more convincing in the former which enabled her to display the considerable vocal range. Superb accompaniment throughout was provided by two highly talented musicians, Anthony Wilson (piano) and Sara Kemsley (flute and keyboard). operahouse’s performance was given without charge so that the profits from the evening could go to two local charities, Wishes for Kids and the Glebe House Project. In 2009 operahouse will be performing “a double bill with a twist..” in Cavalleria Rusticana and I Pagliacci. Details can be found on their website.